As I recently wrote in this column, the decision to participate in the data collection revolution is becoming more of a binary decision, and in 2019, the toll continues to rise with the Merit-based Incentive System (MIPS) penalty exemption. Practices now need 30 points to avoid a penalty, up from 15 in 2018, and participation requires an earlier buy-in to accrue all of the necessary points. This month, Marta Van Beek, MD, MPH, FAAD, Chief of Staff and C. William Hanke Professor of Dermatology at University of Iowa Hospitals and Clinics in Iowa City, IA, and assistant secretary-treasurer for the American Academy of Dermatology (AAD), discusses the many ways that DataDerm can help practices transition to a value-based payment model. How will DataDerm help doctors participate in MIPS? Marta Van Beek, MD: DataDerm is the only comprehensive dermatology registry that is a Qualified Clinical Registry (QCDR), a CMS designation. As such, it allows users to achieve many MIPS measures in addition to reporting on other data. For example, it allows users to contribute to the quality data registry and accrue points in other categories such as the “Advancing Care Information” and “Improvement Activities” categories. QCDRs also host non-MIPS measures that are more relevant to specialty care and can help dermatologists achieve a better performance rating. In addition, DataDerm is different from a traditional registry or an Electronic Medical Record (EMR)-associated registry system because the data and information will be used to advocate for the specialty of dermatology. How has uptake been with DataDerm so far? Dr. Van Beek: Our uptake to DataDerm has outpaced almost every other specialty registry. We continue to get new users. About 3,000 users have contributed data to the registry so far, however, the final numbers usually dramatically increase during the MIPS reporting period. How successful have DataDerm users been at avoiding the MIPS penalty or getting incentive bonuses? Dr. Van Beek: Our members did exceptionally well. 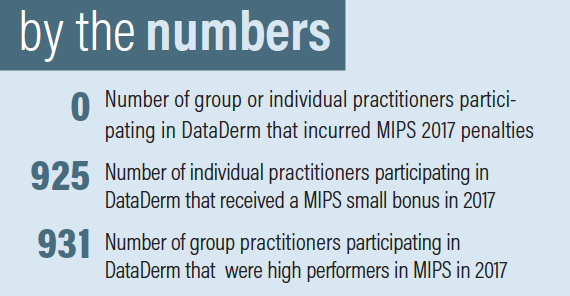 DataDerm users’ overall MIPS scores were very high. A large proportion scored 70 or more points (which is considered exceptional performance), and no users have been penalized. CMS does an annual audit of how accurate QCDRs are, and DataDerm was one of the most accurate with a score of 99 percent, far exceeding other specialty QCDRs. Is there a learning curve for DataDerm users? Dr. Van Beek: Some EMRs interface seamlessly with DataDerm, while others may be more difficult. We have a team that works with your practice administrator to get things up and running smoothly. The whole idea is that there will be no double data entry, because it extracts and collates for you. We want physicians to be able to report to DataDerm without adding extra work. To find out which electronic health records (EHRs) integrate best visit, https://www.aad.org/practicecenter/quality/dataderm. How does DataDerm compare to other EHRs that have their own registries-built in? Dr. Van Beek: The differentiating factor is that DataDerm is about the betterment of our specialty. DataDerm information will be used to constantly improve the care of our patients and to advocate for dermatology among government payers, private payers, and the house of medicine. DataDerm is not just about MIPS reporting. We cull valuable data on treatment trends. 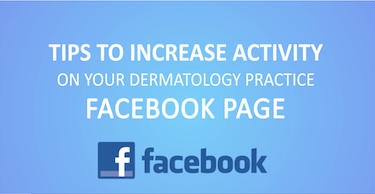 The data helps to advocate in support of dermatology. It can advocate for a new or more expensive medication to treat serious skin diseases by showing what works and what doesn’t. For the first time, we can know how the average dermatologist treats a certain disease. 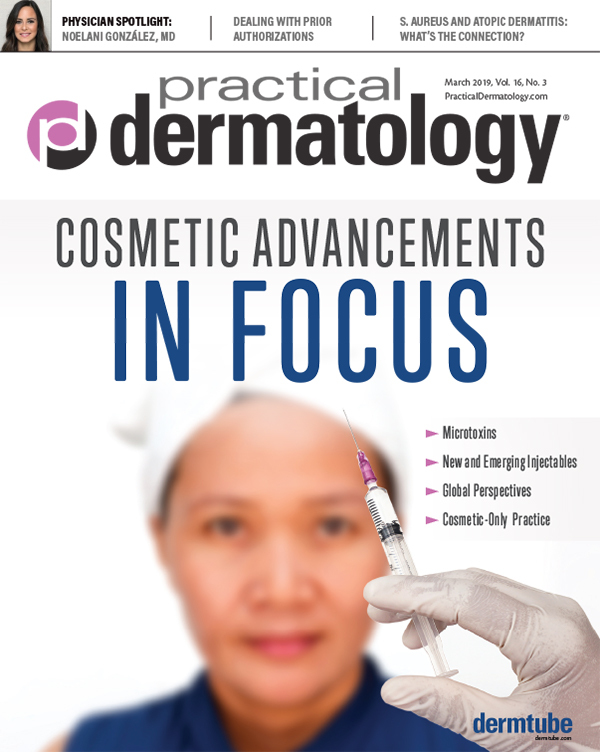 In the past, we gathered information from case series or at a university practice, but as a whole, we didn’t know what was taking place in the average dermatologist’s office across the country. This data give us a better idea of what kind of diseases physicians are seeing on the front lines and help us understand how we can best support them in their practice. DataDerm has made all of this increasingly possible. That said, DataDerm will never analyze, report, or sell patient or provider identifiable data. Our analyses are only done in aggregate to identify trends to help the specialty. Can practices that are still on paper use DataDerm? 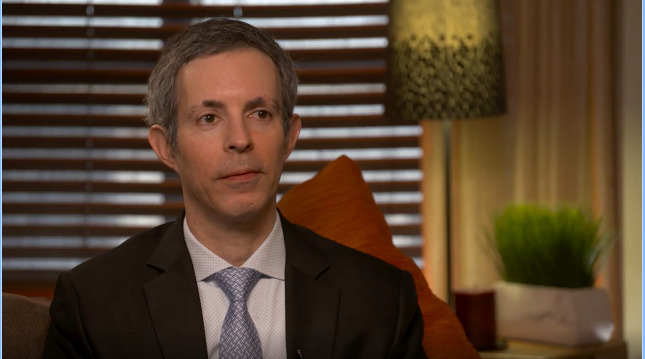 Dr. Van Beek: There is a pathway to do that but this year, however, CMS has attributed additional MIPS points outside of quality that can only be earned if one uses an EHR to connect to DataDerm. This is the time to sign up. There is a nominal MIPS fee to submit to CMS, but participation in DataDerm is free. Historically, the cost of submitting MIPS through DataDerm has been 10 times cheaper than submitting through EHR QCDRs. Mark D. Kaufmann, MD is an Associate Clinical Professor of Dermatology, Dept. of Dermatology at the Icahn School of Medicine at Mount Sinai in New York City.